Published: Oct. 22, 2013 at 07:50 p.m. Updated: Oct. 23, 2013 at 01:33 p.m. File this one under: Stupid Crazy People. New York Giants running back Brandon Jacobs received a death threat from a Twitter user before the Giants' 23-7 win over the Minnesota Vikings on Monday night. 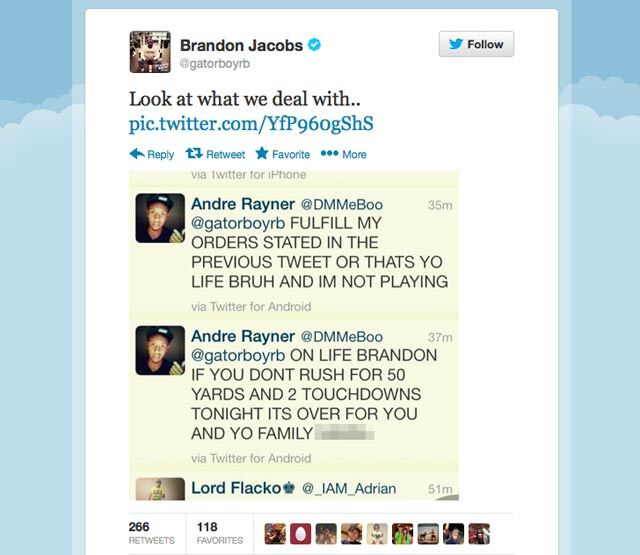 Jacobs -- who missed the game with a hamstring injury -- brought attention to the tweet Tuesday. The Giants said NFL Security is looking into the matter, according to Newsday. The league had no comment. Giants coach Tom Coughlin was disturbed by the threat. "You're always concerned about the player and his family," Coughlin said Tuesday, via Newsday. "For young people to have to worry about things like that, it's not necessary, it's not a part of what we do. I'm not going to speculate on social media. I'm just concerned about however this would be revealed that it's wrong and it has no business in our game." The Twitter user -- posting under the name Andre Rayner with the handle @DMMeBoo -- later sent messages apologizing to Jacobs while also attempting to play off his earlier tweets as a joke. Jacobs didn't respond, according to Newsday. The user has since deactivated the account. That's probably a good idea.